GLYNN STEPHENS admits Horley Town are starting to dream of Wembley after reaching the last 32 of the FA Vase for the first time in their history. The Clarets beat Baffins Milton Rovers 4-1 on Saturday, thanks to an own goal and then strikes from Kerran Boylan, Leyton Regan and Ryan Smith. Portsmouth-based club Rovers finished the game with nine men having had two players sent off in a five-minute second half spell, but Horley boss Stephens insists it wasn’t a bad tempered game. “They did finish with nine men but even with it at 2-1 and 11 versus 11, we were still very much the better side,” he said. “But I can’t suggest for one minute that them losing two players didn’t help us. However, I think even if they had stayed with 11 men we would have won the game. “They had a little bit of a melt down in a five-minute spell. For the first dismissal, the guy had already been booked and then went in for a tackle with one of our players, went to ground and tried to pull our players back with his hands. It was a rugby-style tackle. "Then within five minutes one of their players took exception to a tackle and kicked out. It was right in front of the linesman and so he went as well. Rovers had former Pompey, Preston North End and Queens Park Rangers striker Patrick Agyemang among their line up. “He was still very good but he’s lost his legs a little bit so he wasn’t quite as mobile but if you get the ball up to him and then you couldn’t get it off him,” Stephens said. Horley Town will face Chichester City at the New Defence on Saturday, January 6 in the fourth round proper of the competition. And with a spot in the last 16 at stake, Stephens is beginning to dream of the final, which would be held at the national stadium. “It is a great achievement for the club and I’m really pleased for everyone involved. It’s getting exciting now. We are getting closer but realistically it’s still a long way off. “Chichester are doing well in their league but it’s very tight so I think it will be very evenly matched sides and about who does better on the day. “To get into the last 16 would be an amazing achievement. It’s getting really exciting now. “At the start you just enjoy the ride but then all of a sudden reality hits you and there’s only 32 teams left in it and you’re one of them. “The belief level has gone up now and where it was once a dream, they are now looking at it and thinking that three more wins will put them on the doorstep of Wembley. COACH Chris Weller was sent off as high-flying Horley Town crashed at revived Westfield in the Combined Counties League Premier Division at Woking Park on Tuesday. Weller was ordered from the visitors' dug out by referee Nicholas Brown after 84 minutes as tempers boiled over. TWO Premier League clubs and one Championship promotion chasers watching Horley Town would have been about as unthinkable not so long ago as unfashionable Leicester City winning the top flight title. But times are a changing in football and Clarets’ manager Anthony Jupp was an understandably proud man after Saturday’s remarkable revival to salvage a late draw at 10 men champions elect Hartley Wintney at The Memorial Ground, despite fielding such a young visiting side and naming only three substitutes who were all used effectively. IF aspiring heavyweights Horley Town really do have ambitions to become future champions they must climb back off the canvas after being floored by two knockout punches during this dismal defeat at Wibbandune Sports Ground on Saturday. Their lack of squad strength was exposed ruthlessly, with manager Anthony Jupp and first team coach Matt Chapman having to name themselves as unused substitutes to complete a patched up travelling party which looked distinctly that – patched up. Nadesan hits 50 - and this isn't cricket! LIKE a classy cricketer lifting his bat aloft to celebrate his half-century, Ashley Nadesan bagged another brilliant brace to topple second-placed Ashford Town (Middlesex) in a pulsating clash at The New Defence on Saturday. Appropriately, Nadesan, watched by Brighton & Hove Albion and Colchester United, among his ever growing list of professional clubs’ admirers, reached 50 goals this season as classy Clarets seriously dented their high-flying visitors’ title and promotion ambitions following a frantic and controversial finish. Read more: Nadesan hits 50 - and this isn't cricket! HONESTY is the best policy they say and Horley Town earned top marks for that virtue at a muddy The New Defence on Saturday. 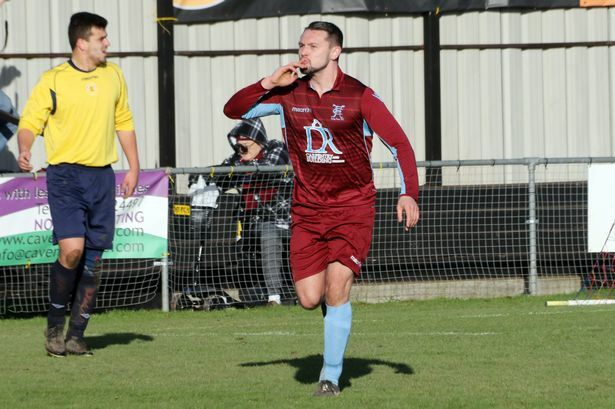 Despite being outplayed by 13th-placed 10-man visitors AFC Hayes, who had beaten Town in their first meeting earlier this season, The Clarets conjured up an unlikely victory from the jaws of a seemingly certain impending shock defeat. The visitors were reduced after 74 minutes when midfielder James Charles was sent off by referee Phil Jones for violent conduct, having floored right-back Scott Robson who needed treatment before continuing.